It was built in 14-15th century. The Inner City of Baku is in the list UNESCO World Heritage Site. BAKU, Azerbaijan – What? Baku? And this is supposed to be about Montreal because I was last there and…? I left off on this blog in Wakefield, Quebec, I am now in Baku, Azerbaijan, and I spent the weekend – and more – in Montreal. So what happened to all those adventures?!? Before they fade from mind – which they will never do entirely – I want to take note here of the extraordinary three nights I spent doing open mics across the world. Starting with the fantastic Mariposa Café open mic in Montreal, where I had an incredible meeting with a guy I know from many, many open mics in Paris! Ventru…. It was Thursday night, and I had just arrived in Montreal. I had written my story as a preview for the race, and I was pretty exhausted from the travel from Wakefield to Montreal, the story research and writing, and I thought, hey, take the night off the open mic scene. But one of the most interesting and fun open mics of Montreal drew me on, inexorably. Well, especially also because I had heard that a colleague from the paddock, Luis from Brazil, was going to attend. So I packed up my courage and my guitar, and headed off to the Mariposa Café open mic that I had discovered last year. Located in a really funky bar/café/restaurant, the open mic was in full swing when I arrived. And it was clear through seeing the crowd and performer through the front window that this was a vintage edition. But what awaited me at the top of the stairs as I entered was, at first, something I took to be an hallucination. I see sitting there the performer from Paris who goes by the stage name of “Ventru.” We have done many open mics together for the last three or so years, in Paris, and the last thing I expected was to see him in Montreal. In fact, my brain was sent for a strange ride through its recollection files as it tried to compute how it could be that this Ventru guy was here in Montreal – was it really him? Or did I know him from Montreal, rather than Paris? All sorts of dementia tricks came into play before I realized that it was just simply Ventru on a visit to Montreal and attending an open mic where I was attending, and where, I should say, he half expected to see me! Anyway, the place was just bursting with performers, audience and vibe. And although I arrived late, my name was on the list as I had warned of my coming in advance, and they have a big heart at the open mic in the Mariposa Café – Victor, the organizer, was awaiting me…. Ventru destroyed the audience, which was mostly anglophile who spoke some French, but also many French speakers. At least I think there were quite a few! In any case, it was a quiet, respectful audience as usual, and some fabulous performers. Oh, and Ventru filmed my first song – where I was nervous as hell, scared shitless at that attention paid to me, and unpracticed thanks to all the work. Another of my favorite open mics in Montreal is the Sunday night Brutopia bar’s open mic on Crescent Street. I did not attend this one last year, as I chose to try another in another part of town. I ended up missing Brutopia, so there was no problem choosing to return this year. It started as a quiet night, and by the time the open mic began, there were only two names on the list, including my own. So I feared I had made a bad choice. But as the night progressed, so progressed the number and quality of performers. I could not believe what a fabulous evening it turned in to, and it had one of the those events that I so enjoy at open mics: A fairly well established young band of musicians – or two of the band – decided to go up and expose themselves in the open mic environment, i.e., using instruments not their own, in a makeshift arrangement of mic and sound system, and just going for it. That was the young band, Xprime, from Niagara Falls. They have a very, very cool sound, but at the same time they were capable of doing one of the neatest, most exact Beatles covers I have ever heard live. This night at Brutopia, in which I got to play twice, or like six songs, was just way beyond my imaginings. A must-attend open mic in Montreal. The travel onwards from there was pretty dire. I had an Air France flight from Montreal to Paris for Monday night to Tuesday, and then an Azerbaijani Airlines flight from Paris to Azerbaijan, 3 hours after arriving in Paris. At least, that was the plan. But there was a pilot’s strike in Air France, and the Paris airport and city were embroiled in all sorts of labor actions…. Also, I had a final one of 6 articles to write for my preview to the Le Mans race this weekend, and by consequence did not sleep on the flight from Montreal to Paris. Or only about an hour and a half absolute max. Once in Paris I spent three hours trying to get my boarding pass for Azerbaijan, and then the flight was delayed two hours. So by the time I got to Baku, I was washed out (as the French say). On my first day, though, just before leaving the Formula One circuit, I decided to check out the open mic scene and…FOUND an open mic that was about to begin less than an hour later!!! It looked like it might be the last of the open mics available to me this week, so I jumped on that opportunity immediately. So I go to this bar, which felt like a cross-section of a little of everything – part Mexican, part curry, part Baku, Turkic Azerbaijani whatever – and found that the MC was from Colombia, the musicians from the U.S., England, Azerbaijan and … Colombia (the MC). And so I got to go up and play, and had I not had plans to go out and eat at a real restaurant afterwards instead of the bar, I would have had a chance to play a second set. Oh, and it was so remarkable: The Azerbaijani band actually started off by singing a song in French!!!! You don’t even find that in Paris, let alone Baku. I’m hoping to play at least one more time here, and if I can find more places, even more. For the moment, I can only recommend this amazing city very, very highly. I’m staying in the old town, finding it picturesque and warm and the people are fabulous. I have not been this close to an Iranian type of situation since the Revolution. But it also reminds me of Turkey; another of my favorite places in the world…. Just a note to say that I have updated my Montreal open mic city guide, The Thumbnail Guide to Montreal Open Mics, Jam Sessions and other Live Music. I have added at least three open mics, and removed the one at the Bull, a pub that just closed down while I was in Montreal earlier this month. I’m so happy to have tasted of four different open mics on that last trip that I had not yet performed in – Mariposa, Medley Simple Malt, l’Escalier and Bar de Courcelle! 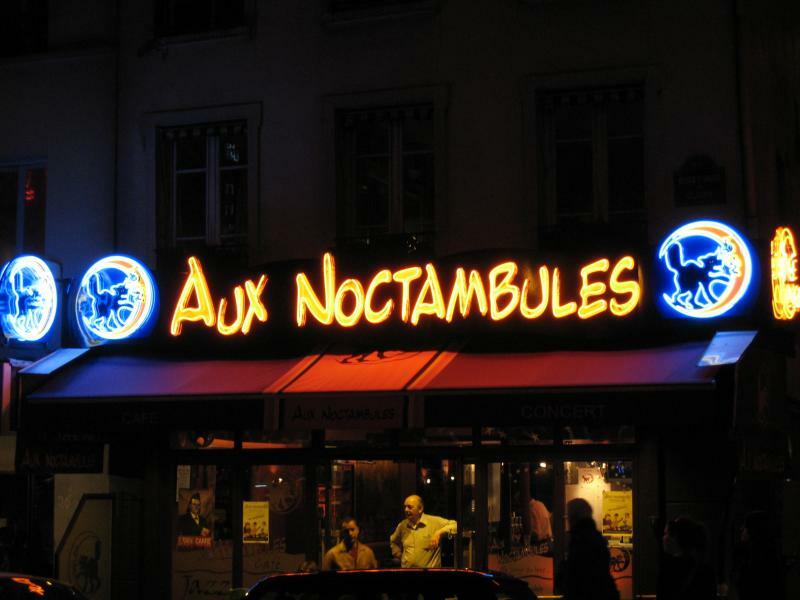 And just a reminder that tonight is another edition of Raphaëlle’s open mic at the Noctambules bar on the Place Pigalle in Paris; a fabulous new open mic in a fabulous old location, with a dream feeling to it since you play behind a mic facing out into the famous, legendary Place Pigalle. (Or you sit on the terrace as a member of the audience and listen to the music and look at the Place too…. MONTREAL – In Canada, the word “Mariposa,” has two main connotations: A folk music festival of that name that started in Orillia, Ontario in 1961 and is still happening there (after moving around a lot); and the name of a fictional small town featuring in the short stories of the Canadian humorist, Stephen Leacock. Now there is a third: The Mariposa open mic in Montreal, which has existed as of today for five years, in a hippie-cool bar-restaurant-café in a residential area near the Villa Maria métro. It was a bit of a trek from my hotel at Berri-UQAM, but I was delighted to find this place and take part in an open mic that was completely different from all the others I have so far done on this trip in Montreal. 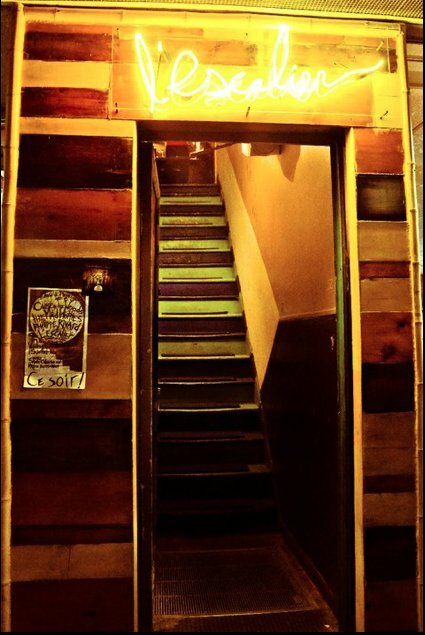 This is low key, quiet, music-oriented, in an environment that inspires creation: Laid back tables, good sound system, large window overlooking the neighbourhood, front porch with tables and chairs, photos on all the walls of rock and folk stars, guitars hanging up behind the stage area…. 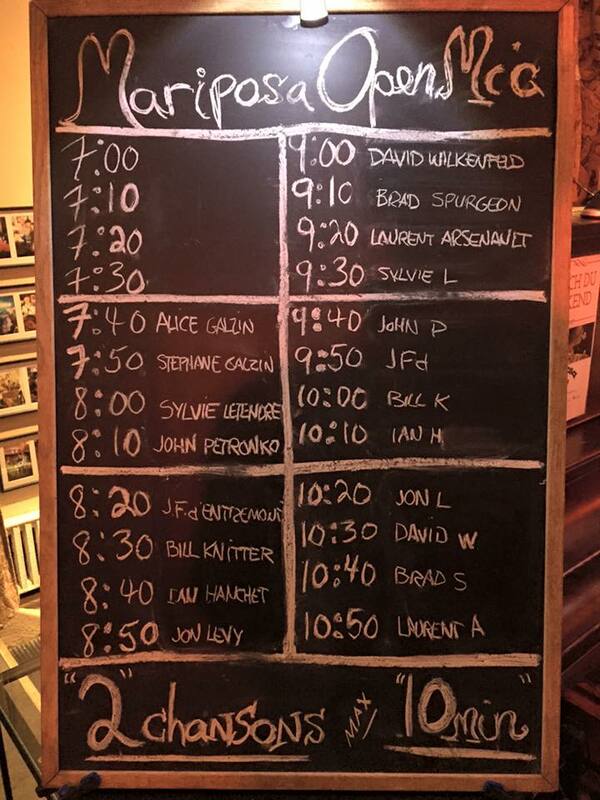 A blackboard where your name is chalked in on a time slot that is well organized with two songs, maximum 10 minutes, and if there is enough time, another round after the first round is done. This was not the crazy, mad youth, rap, comedy and crazy oriented scene of the Escalier from the previous night, but this was very definitely a music-oriented open mic, where fine fingerpicking and piano playing and singing is the goal and the norm. The atmosphere changed quite drastically as the evening – and the beer? – progressed, and the light from the large front windows faded, the curtains opened, and Mariposa took on its full sense. It starts early, ends by around 11 PM, and there’s plenty of time to take the metro back downtown and reflect on an evening well spent. Quel Ambiance at L’Escalier Open Mic in Montreal! MONTREAL – On my third visit to L’Escalier open mic in Montreal I finally got to take part. I’ve mentioned before on this blog that I always showed up too late to get on the list, and I never actually saw much of this regular open mic on Ste. Catherine street, opposite the Berri UQAM metro. Boy, am I glad I finally saw the whole night, and managed to take part; quel ambiance! It turns out that although this open mic runs every Wednesday in this rather bohemian location on the first floor of a building overlooking the park – a vast room that looks like someone’s apartment turned into a bar and vegetarian restaurant – it has two different groups of people that MC it. The show last night was MCd by a guy I met at the open mic on Monday night, at the Medley Simple Malt, a rapper who calls himself Odd Man Black, and is involved in this cool group, Sovereign Music Movement. So there was a high rap, slam and hip hop content last night. But one of the best, most fun acts was a couple of guys doing a beat box routine that was simply amazing. I got pretty carried away recording almost five minutes of it, but it’s well worth viewing the video. I really enjoyed the duet at the beginning, a woman on guitar and vocals and another on violin, as well. And the kind of Quebecois hillbilly street band sort of trio at the beginning was also fun. In fact, I enjoyed most of the acts. 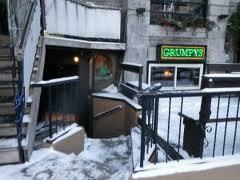 And unlike my previous night, at Grumpy’s, there was even a comedian that really got me laughing a lot. The bar is very bohemian, spread out over several different rooms, with laid back any-style of furniture goes, a comfortably wide choice of beers, and an all-vegetarian menu. The stage is a fabulous comfortable thing sitting in a kitty-corner of the main room, but with views from it of bits of several of the other rooms. The sound system was not bad for the spectators, a little bit difficult for the performer to hear the vocals, but still very respectable. It’s only two songs per person, or around five to seven minutes for the other performers, but anything goes – spoken word, music, rap, comedy or just plain weirdness…. And it was bursting full of an enthusiastic, but not necessarily easy, audience. 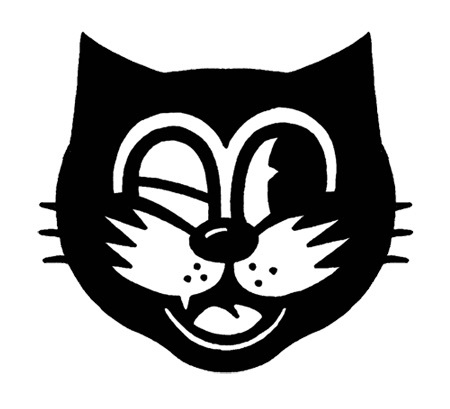 Discerning through the talk, and ready to cheer…. Well worth the wait! MONTREAL – I had no idea what I was getting into last night at the Medley Simple Malt bar open mic in Montreal. It seemed a tiny little bit too far off from the center of town where my hotel is located, near the Berri-UQAM metro. And then, once I got there, stepping out of the Rosemont metro, I felt I had wandered even farther away from civilization than I have bargained for. Until I walked around the block and ended up in the strip of stores, bars, restaurants and other amusements where the Medley Simple Malt bar is located, on Saint-Hubert street. When I entered the bar around 8:20 PM, there were not that many people present, and I feared a dead open mic. I left to eat at a nearby restaurant – had a fabulous confit de canard and another lousy wine – and then headed back to find it still lacked a certain number of people. But bit by bit, the bar filled up, the vibe grew, and by the end of the open mic, the place was just thriving, the open mic was free and easy, open, anything goes, jam, solo, great musicians, a whole lot of French language stuff – relief!!!! – but also English. Totally bilingual. And the barman, and the choice of beers, were all right up there very high on the list of what an open mic should be like. I had a fabulous, four-quarter-pint glass degustation of brews, and a couple of other beers after that – one offered on the house as a musician. It’s a vast bar, wooden walls, counter, tables, a little bit of a western feel to it, with the bar in the center, and all sorts of home brewed beers and other stuff. The crowd was really enthusiastic, the music was good, and there was even one of the staff members who was probably the best guitarist of the evening. Alex’s presentation of the open mic was warm and very competent, as he manned the sound board all night to make sure the volume and sound quality was good. He also accompanied some people on his guitar and did some of his own stuff. 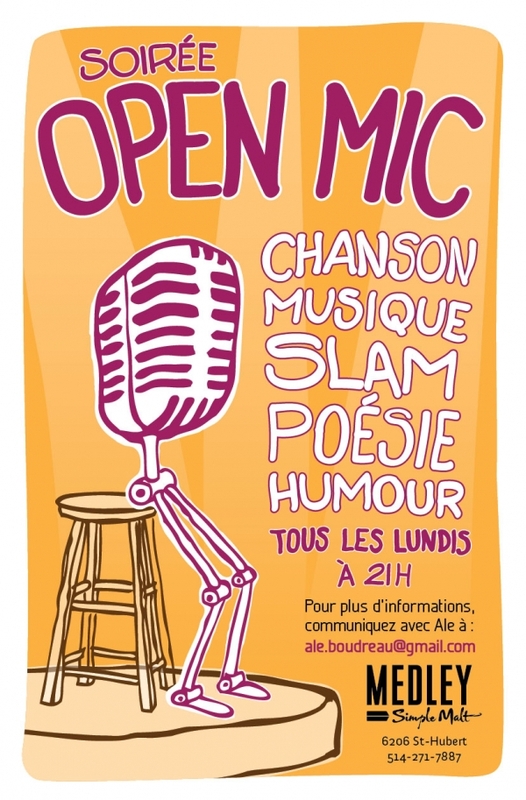 Again, one thing I loved about this open mic was for once it had a very high French Quebecois element to it, and not just another Anglo event in Montreal…. It was much to my surprise at the end of the night that I learned from Alex – and then the barman – that this was in fact only the third time the open mic has been done. It felt like it had been going for a long time, it was such a success in the end. It was one of those open mics where there’s a real sense of community by the end of the evening, and that bodes well for the future. Oh, the only problem was that by the time I left just before 2AM, I didn’t have that many choices on how to get back to my hotel. So I decided to jog it almost all the way down Saint-Hubert, normally a 59 minute walk according to Google Maps, and I think I jogged it – with my guitar and computer on my back and my newspapers in a bag in my hand – in around 35 minutes or so…. Slept like a baby after that….